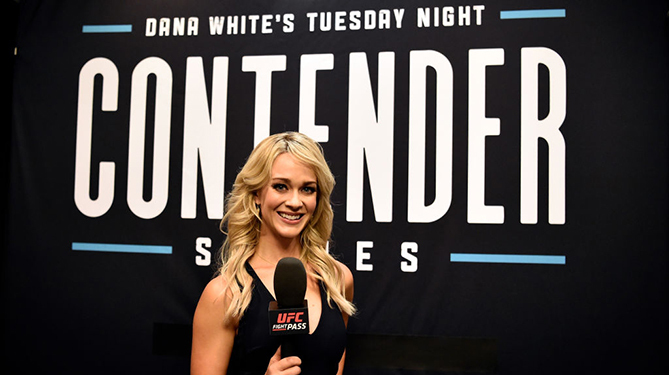 Watching Laura Sanko deliver powerful monologues about Ian Heinisch and Devonte Smith on this season’s final two episodes of Dana White’s Tuesday Night Contender Series, you wouldn’t know that the Kansas City resident wasn’t a trained journalist. Speaking directly into the camera, the 35-year-old recounted the hardships and struggles that led each man down their respective paths to the Octagon, conveying their stories with the gravitas their journeys – and the individual journeys of all the men and women who make their living inside the Octagon – deserve. “I was close to crying,” says Sanko regarding her monologue on Heinisch, the LFA middleweight standout who earned a UFC contract with a first-round stoppage victory over Justin Sumter on the season’s penultimate show. Listening to her explain the behind the scenes process that goes into delivering those stories live on UFC FIGHT PASS or the amount of preparation she does prior to each Contender Series event or FS1 assignment she draws, it sounds like the kind of conversation you would have with someone who graduated from Medill or Newhouse, not a former fighter who was first thrust in front of a camera just a handful of years ago. Sanko fought multiple times as an amateur and earned a second-round submission win over Cassie Robb in her professional debut at Invicta FC 4. She got pregnant while preparing for her second pro fight and when it became clear that her fighting career was going to be placed on hold for an indefinite amount of time, an old friend who always believed she would be great in front of the camera reached out about assuming the Joe Rogan role for Invicta FC. “I would certainly say that my first boss at Invicta FC was the person who – I don’t want to use the word ‘discovered’ because I don’t think anything has been discovered – but the person who first decided to throw me in front of the camera was Corey Smith,” says Sanko, who made her on-camera debut interviewing Marloes Coenen cageside at Invicta FC 5. 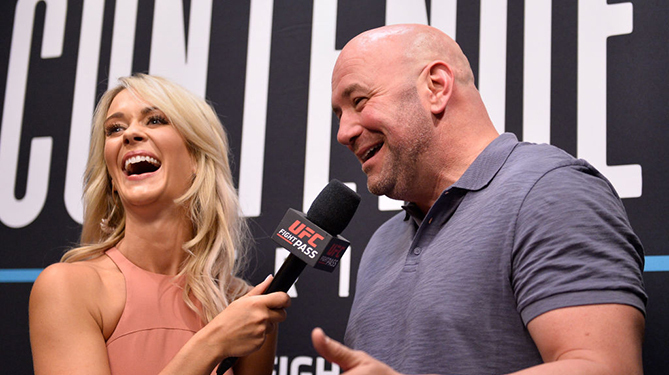 As much as the Contender Series has been an outstanding platform for showcasing and discovering new talent on the way to the UFC, it’s greatest legacy could end up the quality additions to the broadcast crew that have worked their way up the ranks by gaining valuable experience inside the TUF Gym on several Tuesday nights each of the last two summers. Play-by-play men Dan Hellie and Brendan Fitzgerald made their UFC debuts on Season 1 of the runaway hit, with the former taking a major leap forward in his second year on the Tuesday night broadcasts and the latter almost instantly working into the rotation, filling in for Jon Anik whenever the hard-working lead announcer was unavailable. On the other side of the booth, veterans Yves Edwards and Paul Felder alternated weeks during Season 1, before recently retired former middleweight champ Michael Bisping replaced Edwards during this year’s recently completed run. “The Count” has shown promise as a commentator, bringing the self-deprecating wit and sarcasm that made him a great interview during his career and entertaining on the FS1 desk over the last several years to this new role, and Felder has been outstanding from the outset, blending his obvious passion for the sport with technical expertise to make a seamless transition between fighting inside the Octagon and calling the action outside of it. And then there is Sanko, who has gone from never speaking on camera five years ago to being the one constant on the Contender Series the last two years and an obvious candidate for more “playing time” going forward, which is something the competitive former fighter hopes will come her way. “If I’m being honest, there is a part of me that has thought, ‘How many fights do I need to go back and do in order to be taken seriously as an analyst?’ because I would love to be able to have some amount of work in that role,” she continues, acknowledging that there hasn’t been a time where personalities who work as hosts and backstage reporters have crossed over into the analyst’s position and been given the opportunity to share their thoughts and opinions on the action that is about to take place. “But I have a lot of opinions, man, and I’m keeping them in,” she adds with a laugh. “I like telling stories. 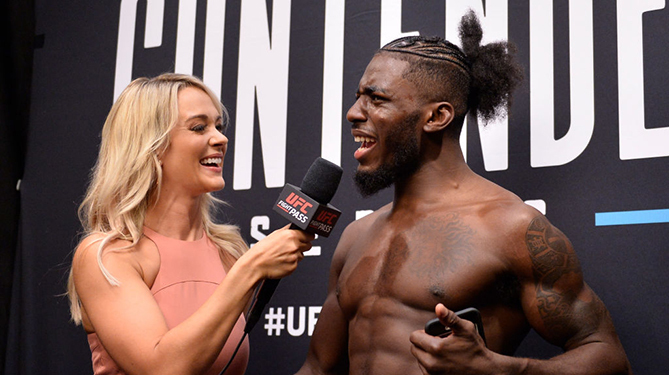 I like being able to convey who people are and who they are as fighters and outside of being fighters and I have that part satisfied, particularly with Contender Series, but there is a part of me that loves breaking things down and offering analysis that I’m not ever going to get as a reporter. Renee Young is poised to make that transition with the WWE, moving into the broadcast position on Monday Night Raw this coming week after working as an interviewer and host with the professional wrestling powerhouse for the last several years and given how quickly Sanko has gone from being a rookie to a highly respected member of the broadcast team, it wouldn’t be surprising to see her get that opportunity somewhere down the line as well. And just as she is whenever she’s working in front of the camera, the talented fighter-turned-broadcaster will be overly prepared when that call comes.